“The Witch’s Familiar” had a tough act to follow after Doctor Who’s exciting Season 9 premiere “The Magician’s Apprentice.” Extending this opening story into two episodes gave us a riveting first episode with an epic feel, followed by a thoughtful yet fun second episode. “The Witch’s Familiar,” wasn’t as strong as the first episode because the conclusion to the story followed a more convoluted path than was necessary, but it was fun to watch Missy lead Clara by the nose and Davros feign regret. “The Witch’s Familiar” gave us two fascinating duos with Missy and Clara engaged in a comedic buddy story, while the Doctor and Davros have a philosophical discussion. The Doctor practices a certain level of acceptance when it comes to Missy’s evil nature. 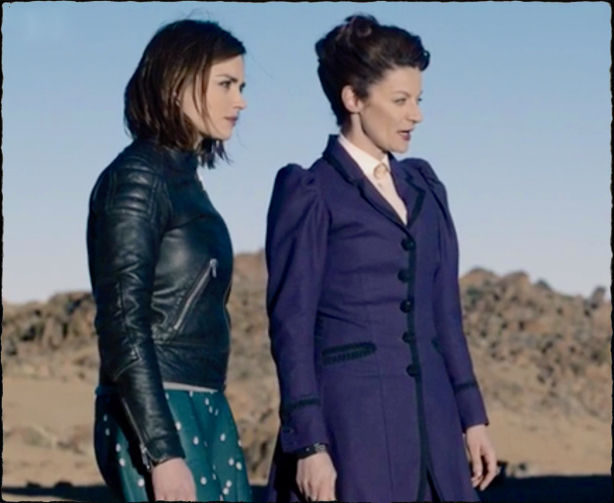 Though we love their dynamic, we wouldn’t expect that Clara would so willingly continue to work with Missy. In “Death in Heaven” Clara had wanted to kill Missy and who could blame her after Missy put the consciousness of Clara’s boyfriend, Danny Pink, into a Cyberman body. It’s surprising that Clara isn’t trying to kill Missy every second of every day. Perhaps time really does heal all wounds, or maybe Clara figures they’ll be time for vengeance later. As the duo heads back into Dalek City, armed only with a stick, Clara not only works with Missy, she follows Missy’s every instruction. There’s still a mystery behind Missy’s relationship with Clara. We learned in “Death in Heaven” that Missy was the one who engineered the Doctor and Clara initially meeting. Missy’s misdirection and manipulations of Clara are pretty fun to watch, though we expect better from a companion who otherwise is quite savvy and independent. Despite the incongruity with Clara’s character, their scenes together are great to watch. Jenna Coleman (Clara) plays the straight man to the perfectly maniacal performance by Michelle Gomez (Missy). While Clara and Missy get up to their hijinks, the Doctor and Davros share some moments that are only possible between the oldest of enemies. Davros is dying and the Doctor is willing to accommodate his wish to talk one last time (with a little pressure from Colony Sarff). Davros has made his contempt for the Doctor’s compassion evident, trying to use it against him. Both Davros and the Doctor hope to use their knowledge of the other to win their thousand-year chess match. Even though we know Davros is evil, the scenes about his last regrets and impending death are quite moving. The acting skill and the chemistry between Julian Bleach (Davros) and Peter Capaldi (the Doctor) makes these scenes believable and emotional. 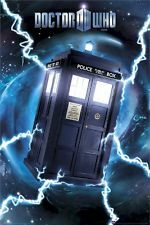 The lengthy discussion between the Doctor and Davros touches on the themes of Doctor Who: compassion, regret, the ambiguity of morality, living with the consequences of one’s actions, and the limits of time. Following the theme in “The Magician’s Apprentice” of cutting to the chase with “Not dead, back, big surprise, never mind,” we find out immediately that Clara and Missy are still alive. It didn’t seem likely either of them would have died, but Steven Moffat does enjoy trying to lead us in the wrong direction. When Clara asks how they survived Missy tells a story of the Doctor surviving an attack by 50 invisible android assassins. Being his oldest friend, Missy loves to quiz Clara about the Doctor. She asks her how the Doctor survived. Clara works out he reconfigured the teleporter and that Missy did something similar with their vortex manipulators. Missy asks why the Doctor always survives, and Clara responds: “Because he always assumes he’s going to win. He always knows there’s a away to survive. He just has to go and find it.” We will be reminded of this later when the Doctor’s ability to outsmart his enemies keeps him one step ahead of Davros. After believing the Daleks have killed Missy and Clara, Davros taunts the Doctor. The Doctor picks up an ancient Dalek weapon and forces Davros to get up. All of the Dalek alarms go off. The Doctors takes Davros’s chair, leaving him unpleasantly squirming on the floor. He arrives in the Dalek high chamber in Davros’s seat and tells the Daleks, “Admit it. You’ve all had this exact nightmare.” The Doctor demands they bring Clara back, warning, “Because if Clara Oswald is really dead, then you better be very, very careful how you tell me.” The Daleks, never known for their subtlety, announce, “Clara Oswald is not alive.” The Doctor thinks he’s outsmarted the Daleks by taking Davros’s force field protected chair, but force fields can’t protect him from the snakes that are Colony Sarff. Apparently force fields have no effect on reptiles. It’s fun to see the Doctor fail sometimes, like falling into a nest of vampire monkeys. Clara and Missy make their way into Dalek City by way of the sewers. Missy tests the depth of a hole by hilariously pushing Clara into it, which causes Clara to impotently threaten her with the pointy stick for about 5 seconds. Clara doesn’t question why the metal Daleks would need sewers, but it becomes clear when Missy reveals the sewers are where centuries old Daleks are left to decay. The Daleks are “genetically hardwired to keep on living, whatever happens” so they can hate for all eternity. Missy tricks Clara once more, handcuffing her and using her as bait. To attack the Dalek Missy plans to use a broach made of Dark Star alloy that “goes through armor plating like a knife through people.” She adds, “The doctor gave it to me when my daughter…” but is interrupted when a Dalek approaches. The holes Missy puts in the Dalek are enough for the hateful decaying Daleks to attack the younger, cannistered version. Down in the sewers Missy has managed to kill a Dalek. Missy pulls out the organic creature and tells Clara to get in. 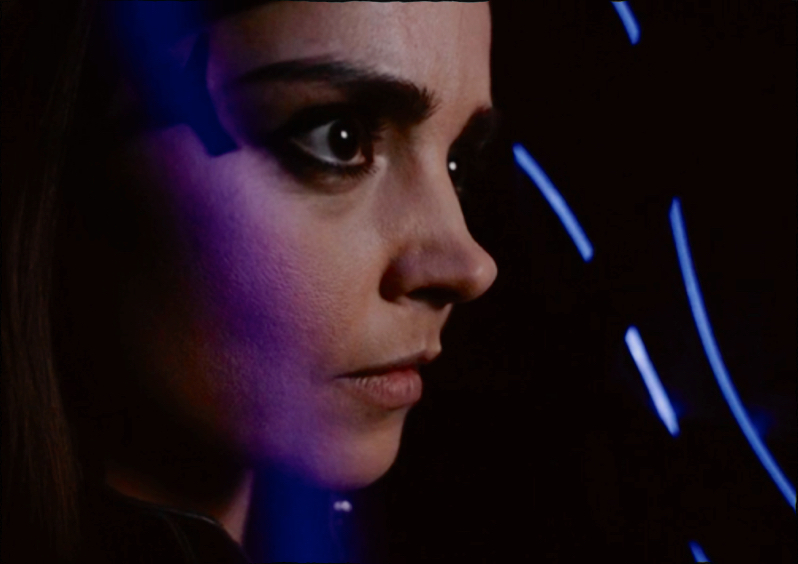 Missy connects Clara into the telepathic controls of the Dalek. Missy closes up the Dalek exterior with Clara inside, despite Clara’s protests. Clara is certainly wiling to go to extreme lengths to help the Doctor. As Clara is trying to say her name, all she can say is “Dalek.” When she tries to say “I love you,” “You are different than me,” and “Exterminate,” it all comes out as “Exterminate. Missy warns her, “Don’t get emotional, it fires the gun.” She explains that Daleks channels emotional energy through a gun, that yelling “exterminate” is how they reload. It’s a pretty interesting explanation for the limited vocabulary of the Daleks. Davros questions why the Doctor ran away from Gallifrey. He doesn’t believe the Doctor’s explanation of boredom and wonders what his confession dial will reveal. The Doctor acts defensive, but when he reaches over the Doctor he grabs his sunglasses from Davros instead of the confession dial. The Doctor asks him why he is asking a personal question after all this time. 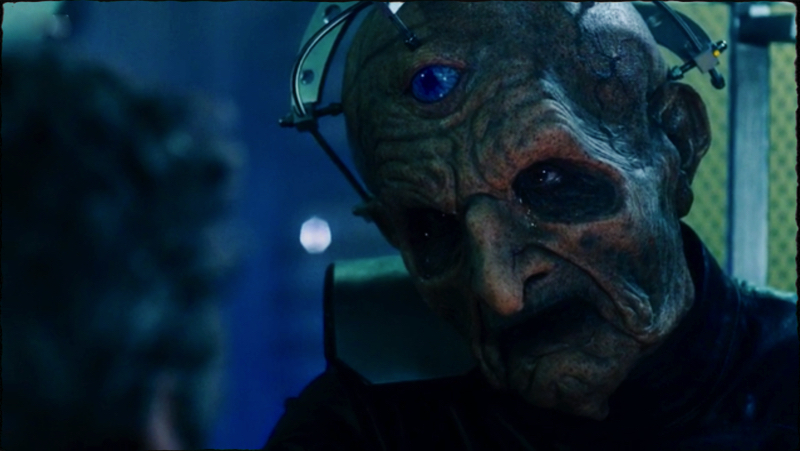 Davros responds, “You have slaughtered billion of my children, and have slaughtered billions of your race. We have exhausted the conventional means of communication.” This may be the best line in the episode, besides Missy’s comedic gems of course. Rather then answer that super awkward question, the Doctor acknowledges that Davros must really be dying. Davros makes a weak joke about him not being a very good doctor, and they have a laugh together. It’s super weird and slightly disturbing. Davros tells the Doctor he was hoping for one last sunset. Missy and Dalek Clara have conned their way into the Dalek control room by pretending Missy is her prisoner. For some reason the Dalek Supreme doesn’t recognize the prisoner who they so recently exterminated. All non-Daleks must look alike to him. Racist. Missy makes jokes that are actually funny, and only slightly weird. Dalek Supreme threatens to exterminate her and Missy responds, “Please, please do, because I have been on my feet all day.” She then offers up the cannistered Clara as a way to control the Doctor. Even though you know it’s part of Missy’s plan, it’s understandable why Clara would panic. Also, with Missy, you get the sense she’d probably be fine with things going either way. The Doctor has sprung into action, connecting Davros back up to his cables so he can see his final sunset. Davros tells him, “I have always admired you, Doctor. I wish just once, we had been on the same side,” and begins to cry. 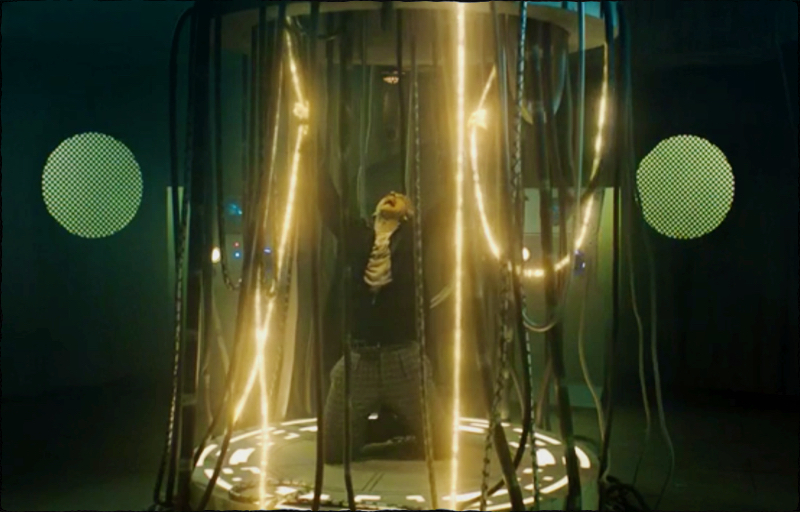 The Doctor decides to use a little bit of his regeneration energy to fulfill Davros’s last request. Missy and Clara-Dalek are still amidst the Daleks when they freeze and begin giving off regeneration energy. She realizes what’s happening and leaves Dalek Clara to find the Doctor. She finds Davros and the Doctor and blasts the cables/Colony Sarff, freeing the Doctor. Despite this, a transfer has already occurred, and the Daleks hail the success of the experiment, praising Davros. 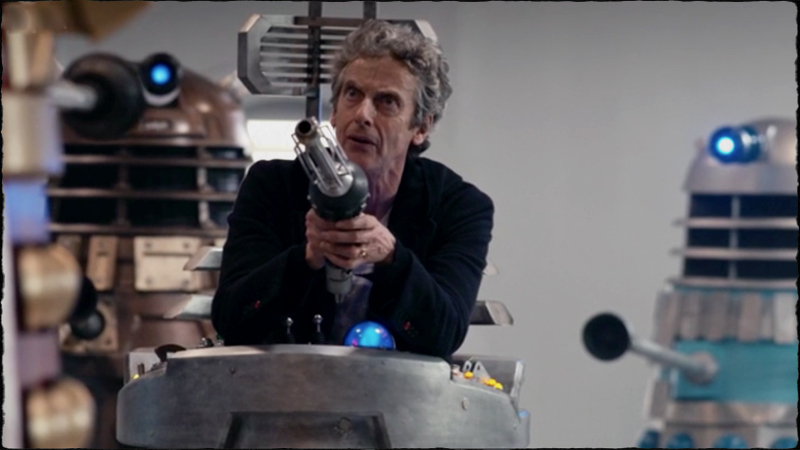 The Doctor asks where Clara is, but she doesn’t answer his question. As Davros gloats, the Doctor tells him that he knew exactly what Davros was doing and let him do it. He tells Davros “Generations of Daleks just woke up very cross, and they are coming up the pipes. So that was your big plan all along? Zap the cables and let the old Dalek remains attack? Why not just go with the genocide option? Or is this the genocide option? The Doctor Missy introduces herself to Davros, then pokes his 3rd eye. It’s hard to believe the Master and Davros have never met after all these years. Though some episodes have multiple Doctors, they don’t often have multiple nemises. Despite the heavy-handedness of the whole friend/enemy theme and the storyline conveniences, there was a lot to like about “The Witch’s Familiar.” Most of it revolved around the great comedic timing of Michelle Gomez (Missy). We also get a tease about the Master/Missy having daughter. With the Master’s return to the series, the show is making interesting connections to the past, such as when Missy refers back to facing the Supreme Dalek on the slopes of the Never Vault. We would have like to see a little more Colony Sarff (Jami Reid-Quarrell) the in second part of this story. He’s seems like a dangerous dude. Though, all the snakes in Davros’s chair were pretty disturbing. The rest of the night we were left freaking out when anything accidentally touched our skin for fear we had snakes crawling all over us. Normally the Doctor’s ability to stay ahead of everyone else gives us clever surprises that emerge when he saves the day. In this episode, there was little to indicate he knew what Davros’s plan was all along. Maybe Peter Caplaldi is just too good of an actor, so he sold us on his compassion for Davros. Julian Bleach was also very convincing. We were starting to believe that Davros really was feeling remorse and despair, despite the inconsistency with everything we know about him. It seemed like a bad idea to tell Davros about Gallifrey, thought it’s mention gave us hope that we could see a return of the Time Lords and their planet this season or the next. Despite the Doctor’s “I knew all along” approach, “The Witch’s Familiar” gave us more good than bad. It was a strongly acted episode, with a lot of surprises, and more humor than we’ve seen since Catherine Tate’s reign. Doctor Who will certainly give us more reveals as we look forward to the rest of Season 9.